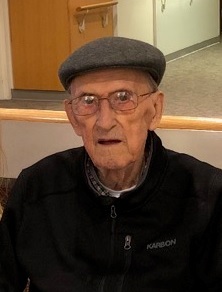 It is with saddened hearts we announce the death of Auguste Morin at Northland Pointe on February 4, 2019 at the age of 89. Devoted husband of Florence (née Démoré). Loving father of Richard (Barbara Jean), Carole (Tom Englefield), Guy (Chantale), André (Debbie) and Paul (Debra). Cherished grandpapa of Eric, Isabelle, Patrick, Denise, Natalie, David, Marie-Christine, Joanne, Jocelyne, Felecia, Justin, Ryan, Céline and Hailey, his great grandchildren and 2 great grandbabies to be arriving soon. He will be missed by his sister Rollande (the late JR.), his brothers and sisters in law and many nieces and nephews. Predeceased by his parents Michel and Emma (Fournier) and the rest of his siblings. Auguste introduced the french sector Conseil 8296 of the Chevaliers de Colomb to Welland where he also was a 4th Degree Knight. A special thanks to the staff at Northland Pointe for their kindness and compassion. The family will receive relatives and friends at the WELLAND FUNERAL HOME 827 East Main Street, Welland on Friday, February 8, 2019 from 10:30 a.m. until 12:15 p.m. The funeral service will begin at 12:30 p.m. in the funeral home chapel. Cremation will follow. A private burial will take place at a later date. As an expression of sympathy, donations to the Alzheimer's Society will be appreciated by the family.